Ask any wedding planner, and odds are, s/he has at some point or another wished they were able to pull off a JLo moment and have a full-on headset to feed a perfect toast or speech at a wedding. 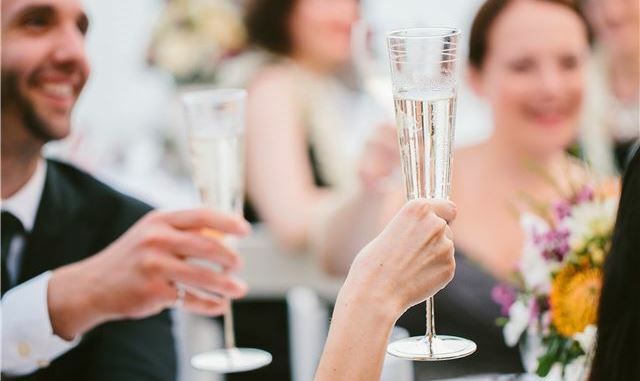 Like every bit of sound wedding planning advice, the recipe for success when asking Bridal party or family members to do a wedding toast starts first and foremost with communication and some ground rules. It is important that the reverence of the day (not to mention the time line, which is what every vendors hinges the entire day on!) is taken into consideration. Remember it is a TOAST not a ROAST. We have all been there. The toast goes off the rails and not only takes extra time but is not appropriate for the audience. Topics to be avoided should always include Spring Break Stories, anything from the Bachelor/Bachelorette Party, and especially details about previous relationships. Grandparents, Parents, Children….keep it G Rated. What a well-intentioned toaster may not know about is all the things happening behind the scenes. Toasts are generally layered either right before or right after a course has been served, if you take more time than what has been allotted for, you are pushing things back and in extreme cases can inadvertently be impacting the kitchen’s ability to ensure a fabulous food presentation. One of the worst-case scenarios for a wedding planner is when the person toasting decides to bring up “surprise speakers”..always challenging and can double and in some cases triple the time. If the Bride and Groom wanted your cousin/neighbor/former roommate to speak, they would have invited them to do so from the beginning. This is more appropriate at the Bachelor/Bachelorette Party when the tone is more casual. This is the most important and most personal part of the toast. Fail-safe topics include either your first meeting (if it was positive!) or when you knew the happy couple was meant to be. End with well-wishes, a personal touch of what specifically “happily ever after” means to them, and don’t forget to raise your glass and smile for the cameras!